As in many parts of western Europe, the preservation of railroad equipment is a vital concern of many people in Canada and the United States. Indeed, it is a rarity for any surviving steam locomotive to be scrapped and many old locomotives are selling for high prices. In RECORD 28 (page 169) and RECORD 35 (page 27) there were brief reports on the operations of surviving steam locomotives in British Columbia. Unfortunately today only two of these machines remain in industrial service. These are the Elk Falls Company's two-truck Shay and MacMillan Bloedel's Baldwin 2−8−2 tank No. 1055. Both operate occasionally in large mill complexes on Vancouver Island. However, some encouraging developments have occurred relating to locomotive preservation. Both of the "Pacific Coast" Shays operated in North Vancouver by Railway Appliance Research Ltd have been preserved and are in operation. No.114 (Lima 3320 of 1928) is now working regularly in passenger service in West Virginia as No.2 on the State operated Cass Scenic Railroad. On this line, a number of geared locomotives are operated on gradients as steep as eleven per cent. The second Shay of Railway Appliance Research Ltd, No.115 (Lima 3350 of 1936) operates during the summer months at Fort Steele, a provincial park in eastern British Columbia. 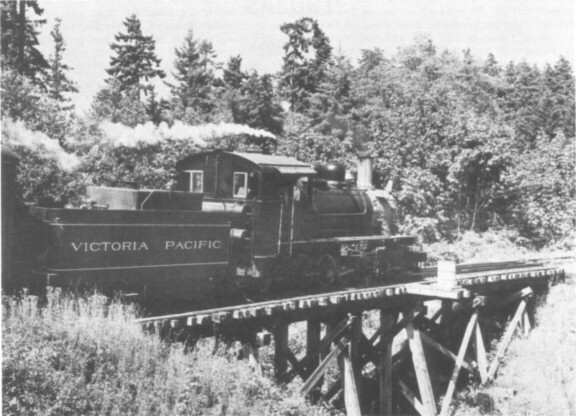 Equally encouraging is the recent opening of the Victoria Pacific Railway operated by Pacific Tours Limited, near Victoria on Vancouver Island. This summer-only passenger line operates on leased Canadian National Railway track. Two locomotives have been acquired for service: a Climax, formerly Hillcrest Lumber Company's No.10 is on display awaiting servicing, while a Baldwin 2−8−2 is steamed daily. (The Climax was illustrated on page 170 of RECORD 28.) The Baldwin has a particularly interesting history. It was built in 1929 (works number 61159) for the Chas R McCormick Lumber Co of Goldfield, Nevada as No.101, a tank engine. 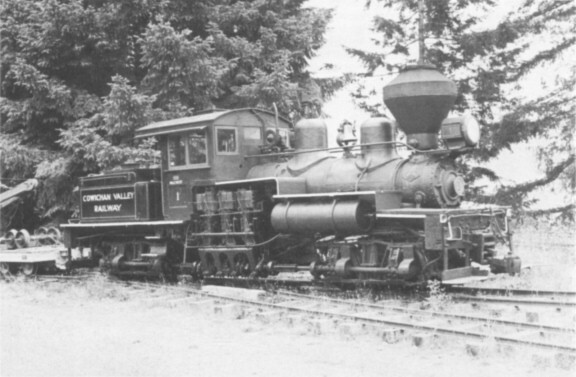 In 1945, the locomotive commenced working at the Comox Logging and Railway Company's Headquarters on Vancouver Island. Comox removed most of the side tanks, filling the remainder with concrete and steel to maintain necessary adhesion, and added a tender. The locomotive was sold to the West Coast Railfan Association of Vancouver in the early 1960's. Later, this much travelled engine spent a year in Alaska during this State's centennial celebrations. Then the No.16 came back to Vancouver Island, leased to the Victoria Pacific. The VP is also acquiring an interesting assortment of passenger and freight equipment for operation and display. A number of other industrial locomotives have been preserved on Vancouver Island at the Cowichan Forest Museum, near Duncan. There, during the summer one steam loco usually works for the benefit of tourists and museum visitors. The display includes three Shays, a Climax, and two small tank locomotives. At present one Shay and a tank engine are operable. While there are a number of other steam locomotives in existence in British Columbia, those I have mentioned are the only operating industrial locomotives in the province. All main line railroads are fully dieselized.